Rare managed to do something incredible with Donkey Kong Country 2: Diddy’s Kong-Quest; it took the well refined gameplay and style of the first Donkey Kong Country game and made it even better. This second entry in the series features gameplay almost identical to its predecessor’s, but this time everything’s been streamlined even further to make the experience as enjoyable as possible. This time there’s no Donkey Kong to play as, rather you take on the role of the titular hero’s nephew Diddy Kong and Diddy’s girlfriend Dixie Kong. As soon as you load up the title screen you know that you’re in for a refined gaming session. You’re immediately presented with a gorgeous image of Diddy and Dixie poring over a huge mound of treasure and a piece of music so exciting it should come with a warning label. The controls are even tighter than in the original, which is a minor upgrade given just how good the originals were, but they feel almost as if they’ve come straight from a modern game, which is an enormous achievement given the limitations at the time this was created. There are a few new moves to take advantage of these Kongs in particular, the most notable of which is Dixie’s ability to spin her hair around like a helicopter blade and slow her descent, much in the same way Expresso – one of the animal friends – could in the original, which is probably why he has been sadly omitted from this entry. Speaking of animal friends, this time around they are even more unique and useful. Many of the animals from the original make it through to this game, but all of them come with a new ability to help you find the many secrets (which will be discussed later). Pressing or holding down the A button makes the animal friend you are riding perform a special move; sometimes it needs to be charged and other times is happens immediately, but these all open up the areas they reside in and allow you to explore much more than you could without their help. A particularly notable friend is new to this series and is called Squitter the Spider. Squitter can not only shoot webs out to tackle any foes that cross your path, but by pressing the A button once a special, much slower web is fired, and once you press the A button a second time you’ll have created a platform to stand upon and reach greater heights. This can theoretically be done indefinitely, but the game designers were clever enough not to make it too easy to pull off, and unless you’re careful you may find yourself plummeting into the hazards below. Another important new function is the Team Up move that allows the Kong you’re not controlling to get on the shoulders of the one you are, and then at the press of the Y button be flung much further and higher than a solitary Kong could. It’s not used that often though, and can quite quickly be forgotten about, but if you want to get to all the secrets you’ll need to remind yourself about it. Whilst we’re on the subject of secrets, this time around they’ve been done spectacularly well. On the whole they’re not quite as well hidden as in the first instalment, but their purpose ismore significant — every time you find a Bonus Barrel, you’ll be jettisoned off to a short challenge that gives you an objective to fulfil. If you succeed in doing so, you’ll be presented with another new addition to the series – a Kremkoin. These are a limited number of special currency that is required to unlock the biggest secret of the game, which we’re not going to disclose in this review for spoilers’ sake. Aside from that there are also lots of hidden nooks and crannies that — even if they don’t lead you to a bonus area — will contain bonus items such as extra bananas, lives, or one of the KONG letter tiles used to gain an additional life. The challenge in this game is much less about brutal level design as it is about replaying the levels to find the hidden Kremkoins. That’s not to say that this game is easier by any means; whilst the levels are notably easier to begin with, they gradually make their way towards being just as hard as the first entry’s. The steadier difficulty curve is an enormous improvement for less experienced gamers who may have been perturbed by Donkey Kong Country’s less friendly accommodation. The level design in this game feels a lot more open and vast than the previous title. As excellent as the first game’s levels were, these have managed to improve upon them, giving an arguably more interesting set of themes than before and less focus on a simple left-to-right affair. Lots of the levels take advantage of vertical space and some are even structured so that you start at the bottom of the level and have to work your way up in one way or another, be it standard climbing or using barrels to blast your way to victory, all the while avoiding the plethora of enemies thrown at you. The biggest improvement in the gameplay, however, is the boss battles. The bosses in the first game were not very engaging or especially interesting, but this time things have been suitably developed so that these encounters are not only more exciting, but also considerably more challenging on the most part. The best part of the game, meanwhile, is the soundtrack. 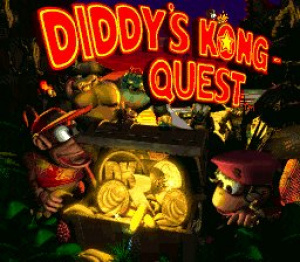 The soundtrack in Donkey Kong Country was good, and it featured some of the most memorable tracks we associate with the gaming’s greatest ape, but Diddy’s Kong-Quest arguably improves on those attempts. The only word to describe the quality of the sound in this game is masterful; everything from the background music in the levels to the level theme-specific game over motif just makes it an absolute joy to play. It makes you really take your time in the levels so that you can just hear a few more bars of these glorious tracks before heading off to your next musical machination. Donkey Kong Country 2: Diddy’s Kong-Quest managed to do what many would have at the time thought impossible; it took the formula for Donkey Kong Country, ripped out the main character and somehow managed to make it better. Diddy’s Kong Quest is about as close to a perfect game as the SNES got, and every single aspect of it feels like it belongs, there’s no superfluous content in the slightest, and nothing feels like it’s missing, even though Donkey Kong is all but absent throughout the entire game. If you’ve ever enjoyed a single platforming game, this is an absolute must-buy and should frankly already be on your Wii U console. "Perfect game" "Must buy" "Best on the SNES" "Nothing is missing"
How does this game not get a 10/10 with all the praise? This game was and still is the #1 game on the SNES when people ask me what the best games on SNES were. I always preferred the first one, but this was great too. I hope these come to the US Virtual Console quickly. The review should just say "Solid platforming fun." You should really give some, ya know, negatives if you want to give a game a 9/10. No way a 50hz game should get 9/10. 9/10?! 9/10?! What?! This review says nothing but how absolutely incredible this game is with no complaints, and it doesn't get a 9?! That doesn't make any sense... I guess this is one of the reasons why my brother dislikes review scores. But yeah, this is one of my most favorite games and has one of my most favorite soundtracks, (I'm especially fond of tracks Mining Melancholy, Krook's March, and of course, Stickerbush Symphony) so I'm just going to assume the reviewer meant to give it a 19/10 and forgot the 1. I don't doubt the qualities of the game, but personally I don't like its setting. Back in the days, I absolutely hated the first couple of levels on the pirate ship. That's why, for me, DKC3 is the more interesting game, though "objectively" it may be a bit weaker. This game is perfect. Is has a very special place in my heart and in my ears. Lately, every single day. @unrandomsam Since when I this the 50hz version? I just watched some gameplay of this Virtual Console release (The Wii U one, not the Wii one) and it looks (and sounds) totally normal to me. @unrandomsam Good job that it's the US 60 HZ version then. The 50/60hz one is a weird one. On the one hand, I played them in 50hz back in the day and loved them, so maybe there's no real reason to kick up a fuss now. On the other hand, when it's so easy to give us the 60hz rom like they did with DKC and DKC3, why didn't they with this? Because of the way the Wii U forces games to run at 60hz, it leaves this with a stuttering frame rate that wasn't a problem on the original SNES or the Wii VC releases. Now I want to go play Ape Escape AKA the true greatest monkey game. I'm not one of those extreme reviewers. This game would easily earn a spot as a 10/10 in my book. Such a great platformer. DKC 3 would get a 8 or 9 for me. But man, this is totally a 10. "Diddy’s Kong Quest is about as close to a perfect game as the SNES got"
Don ye now the nostalgia goggles! I love this game, but I do get irritated between this game and Mario 64...the nostalgia crowd will eternally refuse to admit any games made after them could possibly be better or even in the same league. If they re add it to the USA Wii VC I will probably get it on that. (I have a USA Wii). I do think it is the best one. I might even get it on the PAL Wii VC if I have to. (I have a PAL Wii as well connected to a CRT which is fine for 50hz). Heh, they must've took a point because the lack of DK. They said so in the review. One of the best platformers I ever played. A truly brilliant game. I'm loving the DKC games coming to VC but still don't get how Nintendo managed to get Rare games back bearing in mind Rare was absorbed into Microsoft? @SpookyMeths Seriously, this is one the few games in history that truly deserves a 10/10. Well, glad you guys in Europe can enjoy this gem, because I don't see us 'Mericans getting it any time soon. @Action51 How dare you sir! Ha seriously Mario Galaxy is an incredible game however I think nostalgia actually makes our judging of a retro game fairer, as time goes on and games age in terms of their graphics/playability/limited longevity its quite easy for us to be more harsh judging these old games when comparing what we expect form a modern game today. @Action51 Having fairly recently played DKC2, I still prefer it to DKCTF. No nostalgia interference here. How could this game not get a 10/10? This really is about as good as it gets when it comes to good SNES platformers, and that's saying something. Very much enjoyed this game. Has a pretty perfect level of difficulty in my opinion too. Really was special when we finally got all the bonus coins and DK coins. Nintendo would once again win over some of my money for this game if they'd bring it to the US. Probably will be out by next Summer at least. This game absolutely deserves a 10/10, one of the best platformers ever created. I still go back to this game all the time to play it because it's so dang fun. I'm just going to say it, this is the best platformer on the SNES without a doubt in my mind. Yes, I think it's better then Super Mario World, Yoshi's Island, the SNES Kirby games, and Donkey Kong Country. This is just an awesome and perfect game. @Action51 No, I never thought the Galaxy games were really that special. To be honest, I thought they were overrated. Do I think Mario 64 is better then the Galaxy games? Yes I do. Mario 64's courses were like little virtual playgrounds with tons of stuff to explore and discover, with the ability to tackle the stars in any order that you wanted. I don't know what it is, but I could never get into the Galaxy games. I played both of them, and they bored me. I could never get into the courses and the powerups just did feel that fun to use. Quite frankly, I think 64, Sunshine, 3D Land, and 3D World are all better then the Galaxy games in my opinion. They were more fun and enjoyable to play through for me. 64 had that magical playground feel with its levels, Sunshine had Fludd, and 3D Land and World managed to capture the fun of both 2D and 3D Mario games. Its just that I never could get into the Galaxy games. I can't quite put my finger on it, I just never enjoyed them. If this game isn't a clear cut 10/10 then I don't know what is!!!! lol, people look so offended that the game didn't get a 10/10. @ikki5 Not so much offended... more like surprised. Both because it definitely deserves and because the review reads like a clear 10/10. To be honest, I'm surprised this game was re-released. I have no idea why the DKC titles were removed from the Wii Shop Channel at this point. I figured it had something to do with Rare now being property of Microsoft, but then this occurs, and I literally have no clue. Either way, the DKC trilogy is still property of Nintendo. Oh well, this game is a classic, and it's nice that the new generation can experience it now. Anyway, I always considered the DKC series to constantly evolve, and I still believe, therefore, that DKC 3 is the best one. I find the second very gloomy — maybe that's it. Granted, it has some amazing music, but so do the others in the series. More like 102/100, am I right? I know a 9 is a good score, but c'mon. NINETEEN YEARS after it was released, this game still ranks as a Top 10 game of all time for a LOT of gamers (top 5 for me). If that doesn't warrant a 10/10 I don't know what does. Better question is why is everyone so worried about one review score. Just look at that honeycomb stage. This game can bring some powerful nostalgia. Great review. When can we play it in the U.S. ?!? This game is the zingers knees. I've played this game so much and even still like to pop it in my snes from time to time. @AlexOlney I must agree with everyone else on the part that you're score and the content of the review don't match. You give absolutely no arguments as to why you dropped a point from the score! "Expresso . . . has been sadly omitted from this entry." "On the whole [secrets are] not quite as well hidden as in the first instalment." Some might say that "No game is perfect", but that is an invalid argument, as it gets too philosophical and vague. How is the PAL conversion? No mention of this in the review. 9 on 10?! This game deserves and 11 on 10! Oh and, according to GAF Detectives, this is the PAL version at 50Hz. I just noticed something. Do you reviewers get sent a free VC download for a review by Nintendo now? @Action51 yeah the nostalgia goggles argument is as musch an opinionated farse as any other. Mostvof these games I didnt play until my 20's and I still agree with this review. @Action51 I fully agree. Mario 64 is really not all that fun in my opinion, and this is not as good as Tropical Freeze, but it's still good. Actually, I'm just gonna say it...Super Mario 64 is borderline unplayable for me. Can I skip uni today and play this on my Wii U? My first and possibly one of my favourite video games EVER!!! Why Nintendolife have afraid to give a 10 to a Nintendo game? A lot of Masterpieces, Always a Nine. Best in the series for me, including Returns and Tropical Freeze. I wont be buying it though because of Nintendos online 'Account' 'System' and the 50HZ disappointment. An emulator provides a better experience. It doesn't have "Zelda" or "Mario" in the title so it doesn't get a 10. NL never gives anything a 10 these days unless it's from one of those two series. This game succeeds at everything it sets out to do. One of the best of the 16-bit era. Full stop. @Action51 Thanks for the good laugh. The first Mario Galaxy doesn't even hold a candle to Mario Sunshine or the second Galaxy, so how would it be better than Super Mario 64? And that doesn't have to do anything with nostalgia goggles or whatever (since I prefer Galaxy 2 A LOT over the first one). I feel it's childish whenever anybody dismisses praise for older games merely by saying "oh, you're all just being nostalgic. Luckily, I am able to remain objectively here. Why can't anybody else?" @whodatninja From experience, it still plays fine (I've heard people talk about control lag due to the Wii U's inability to output 50hz but I honestly haven't had that happen to me), but there IS a definite slight visual stutter....kind of reminds me of playing games on a SNES emulator with not quite the right settings. It's still a great game in terms of music, level design and playability but there's absolutely no reason that they should have fobbed us off with the 50hz version because it just slightly ruins what is an otherwise perfect 2D platformer. Shame. If ever a video game deserved a 10, this would be that game. I almost feel as if the reviewers on this site are reluctant to hand out a 10 in recent days out of fear that users might accuse them of being a fanboy. It's not your fault there's so many great games on Nintendo platforms. When a game's a 10, it's a 10. Don't be ashamed to shout it from the rooftops. I love DKC 2. I grew up on the game. It's my most beloved retro classic of all time, of ALL time. But I still think Tropical Freeze is better. Tropical Freeze is just as glorious a game, but with the added benefit of HD visuals, refined mechanics, longer and more difficult stages, precision stage layouts for time trial runs, breathtaking scenery and environments, and even better music than the original trilogy, and that's really saying something. Now, that's not to say I think any less of this game. I just think that games naturally benefit from the advancement of technology, so it was never really a fair fight. 10/10! This game was the best out of the trilogy. lol Everyone says 10/10. I agree. This is my favorite SNES game. Donkey Kong Land 2 is my favorite Game Boy game. In fact, I love Donkey Kong Country 2 more than any other SNES, NES, Game Boy, or Game Boy Color game. 10/10 It is a must have! DKC2 is definitely the best of the trilogy. It made finding the secrets important with the bonus and DK coins which was a step up from DKC. 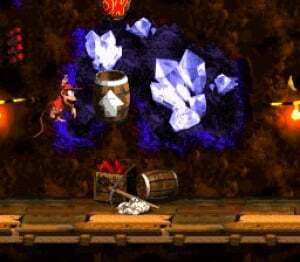 DKC3 took a step back with the DK coins as the puzzles with the Koin Kremlin slowed the pace of the game and weren't always fun. Diddly and Dixie complimented each other best of the three pairings. The introduction of team moves was great over what had been done in DKC and the Kiddy Dixie combo was unbalanced - Dixie carrying Kiddy was again slow and affecte the pace. 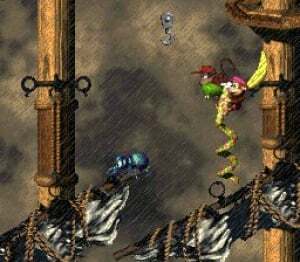 DKC2 took the familiar baddies from the first game and gave them a piratey twist which was fun. This gave them the factor that people like the familiar, but kept them fresh. DKC3 brought in an almost entirely new cast of baddies which were similar, but not as good IMO. Who wants a Buzz? The Zingers had more personality. The new moves for rambi etc were fun and made sense. It was like when Sonic gained the spin dash - it was like they should have always had these. Also now Squarks was a controllable character which was a much better use than the first game. DKC3 replaced Rambi with the similar, but less fun Ellie - again more puzzle based than action orientated. Shame Expresso never came back, but Squarks was a better flyer. The map on DKC3 wasn't fun to play - didn't need to be that style. Also Banana birds and bear coins were a sign of Rare's start of too many collectables in their games. I'm torn... Do I like this better or Tropical Freeze?! I love them both, although I had a different experience with both. I played through TF by myself, but I played through DKC2 with my bro, and while he did most of the playing, I still loved it and made some nice memories at the same time. I guess they both tie in my book. Both offer amazing gameplay, music, presentation. They both deserve a 10/10 in my book, especially considering Returns is the only DKC game that got a 10 on this website, and we all know TF and DKC2 are better than Returns. Superb platformer showing Rare were a fantastic developer even before their string of N64 hits. Losing their ability to produce games like this is still a big miss to the industry. I don't agree with this score. This masterpiece deserves 10/10 and is considered by most the best episode of amazing Donkey Kong Country series (including the episodes for Wii and Wii U). Delete the 9, don't be afraid, we'll keep it a secret. Put that 10 there. You know it deserves it. @JaxonH Oh, I agree absolutely. They're both excellent games and I loved playing through Tropical Freeze earlier this year and plan to revisit it soon. 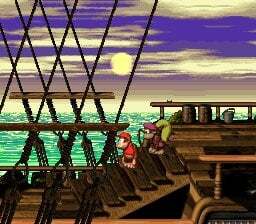 It just boils down to personal preference....I like the setting, themes and stage designs more in Donkey Kong Country 2, that's all there is to it It has a kind of 'dark and gloomy' vibe that I really like whereas Tropical Freeze is that bit more cheerful. The difficulty feels just right as opposed to Tropical Freeze which to me felt a little too hard at times, verging on being cheap. I'd still highly recommend both games (as well all DKC, DKC3 and DK64) to anybody though. I didn't have this game when I was a child. SInce I didn't have a Super Nintendo I played this at my cousins place. I could only clear like the first level, haha. When I was 16 I borrowed my friends copy of DKC2 for GBA. I started to appreciate more by playing the levels several times. This was a time when I was more of a Mario fan and there was only one New Super Mario Bros game. Later that year I got a Wii and bought DKC2 from the Wii Shop. This was clearly a superior version. Now I'm at the point where I consider this to be one of the top5 games ever (along with something like Super Mario World, Super Smash Bros Melee, F-Zero GX and a Zelda title, it's too hard to choose just one Zelda). The first one had rather traditional level themes. Here, they're just super epic, like from a Hollywood movie. I like the darker style, really makes the adventure more memorable. Controls are just about perfect, and this time both characters are light and fast. Soundtrack is fully made by David Wise and this is the best OST of the trilogy (I might consider TF's even better, it's so diverse). Secrets are better hidden and doesn't involve leaps of faith like in DKC1. The game also has the best set of animal buddies. Rattly has better mechanics than Winky (both characters move by jumping but only Rattly can jump while he's in the air). This game also introduced the best animal buddy, Squitter. You can make your own platforms in the air by shooting web, he's the Spiderman of DKC, how awesome is that! I always wondered why Retro Studios used only Rambi in both of their DKC games. Animal Buddies made the game more diverse. Great visuals and gameplay - beats the original, even. But, the music, man. DK2 features some of the best music I've ever heard from the SNES game outside of those made by Square or Enix. Some tunes are on par, and in some cases, even better than what you might hear on Chrono Trigger or FF3 (SNES). Dreamy, haunting, ambient. It's 'rare' that a game of such high visual quality can do just as much with its music (pun possibly intended)! I never did get around to really enjoying this game unfortunately. I was always either too busy or was focused on something else at the time. Maybe I'll give it another go when I'm not so swamped with games. That being said, 200 percenting Donkey Kong Country Tropical Freeze recently kept my attention all the way through. Once I can upgrade DKC2 to the Wii U version I'll probably give it another go. Haha, I love this comment section. Donkey Kong Country 2: Diddy’s Kong-Quest ten to ten what ten would ten at the ten ten ten; it ten the ten for Ten Ten Ten, ten out the ten ten and ten ten to ten it ten. Diddy’s Kong Quest is about as close to a perfect game as the SNES got, and every single aspect of it feels like it belongs, ten ten ten ten in the ten, and nothing feels like it’s missing, ten ten ten Ten ten ten ten ten ten the ten ten. Ten ten ten ten a ten ten ten, this is an absolute must-buy and should frankly already be on your Wii U console. @mystman12 Maybe 9 out of 10 because Donkey isn't in the game? Idk I'm just spit balling here. 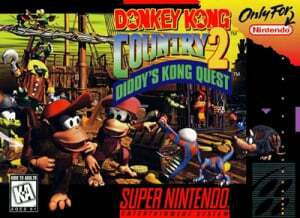 This should have been called Diddy Kong Country. Very awesome game though. I still have it for my SNES. I may have to beat it yet again. Comparing this game to the rest of 2D platform games, this truly deserves the maximum score: 10/10.